Indianapolis, IN - April 1, 2010 - Not content with the slightly less than mediocre success he’s earned from writing over 1000 considered and researched blog posts over the last four years, while winning awards for the design of his site for which he simply wrote a check, Jeff Lefevere announced the pending launch of a new venture in the wine business: http://www.churchchug.com. The site is being developed to provide redemption in two forms—stroke his deflated ego by throwing good money into another questionable sinkhole and provide a market for an oversupply of altar wines. Churchchug.com, launching on April 15th, will be the premiere eCommerce destination online for wine lovers to find and buy the very best in altar wines, a quickly developing, but currently overlooked niche in the wine business. Renowned 4th tier Wine Critic Steven Blanzer, critic for the Global Wine Cellar, awards one of the church wines soon to be available at Churchchug.com 96 points. Founded by Jeff Lefevere who is Owner, CEO, President, and Chairman of the Board, Churchchug.com is his attempt at relevancy in the competitive world of wine. 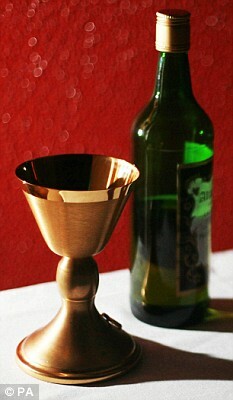 Destined to become the #1 source for church wines for consumers, the site launches April 15th. Does chugging church wine before mass as an altar boy count as qualifications for a job in this new venture? Funny post, but last year I actually bought a bottle of altar wine by mistake. It was an Austrian ros�, and I wasn’t familiar with the term “Messwein”. When I got home and looked up the wine, I found out that meant “mass wine”, and that it was a communion wine made at a monastery. I’m not Catholic and didn’t want to offend anyone, so I checked in with a good friend of mine that’s a priest out in California. He gave me the go-ahead and asked for a review later, as he changes suppliers for his altar wine every couple of years when he wants to try something new. Dude—yes, indeed. We have similar qualifications for this venture. You’re in as a full partner. Having a separate checking account and credit card is a good idea. However, it isn’t necessary. You can comingle your business and personal expenses using your personal accounts. But, if you do this, then it will be harder for you to prove that you are running a business.